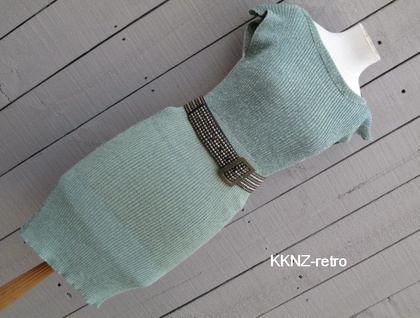 This is a exclusive dress, only 1 knitted, retro vintage inspired simple style with various green shades & marle effect. Approx size a very loose 16. 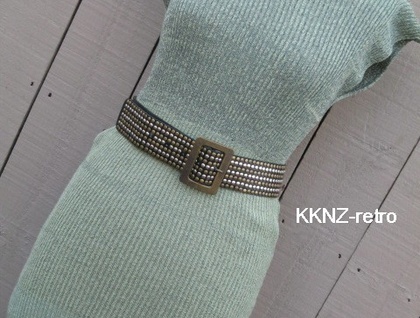 Dress it up or down, wear it on top of other garments or just on its own. Yarns used are Italian Viscose Rayon Stretch with hints of sparkle. It feels cold and soft. Any questions or feedback is welcomed. Please view my other pieces. Thank you. Couriered to you by COURIER POST COURIERS or if you wish to try this on first contact me for a time. Sorry the belt is not included.